1.20.18 – This past Saturday, staff writers Bridget, Shannon, and Nikhil attended the newest edition of Sofar Sounds hosted in Champaign. For those unfamiliar, Sofar Sounds organizes secret, intimate shows in random local venues that are only revealed the day before the show. Performers are also kept secret until the show starts, so attendee’s are encouraged to keep an open mind and enjoy music in a new, unfamiliar environment. 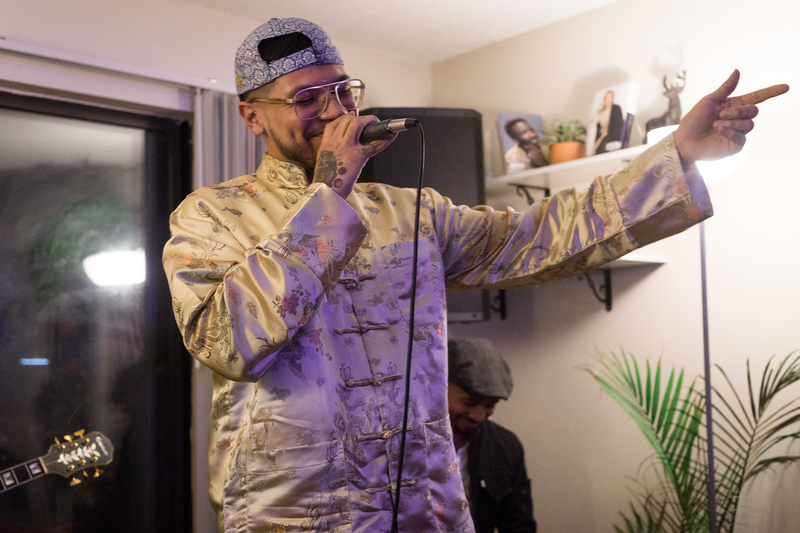 Past performances from Sofar Sounds Champaign include: Ausar, Molly M. Mclay, Stewart Arp, The Bashful Youngins, and Cii La’ Cole to name a few. 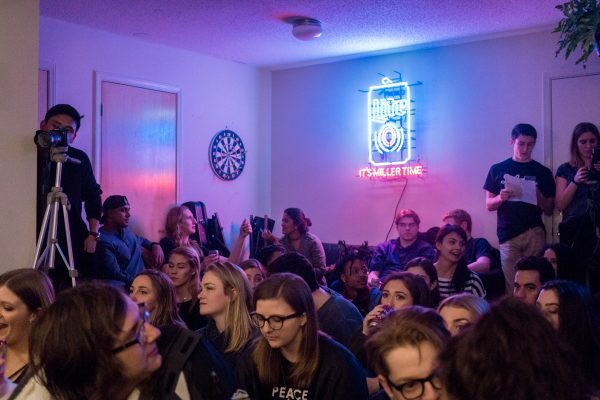 The most recent Champaign Sofar event was held in a local apartment building where around 60 attentive audience members gathered to watch the three eclectic performers of the night: Coastal Club, Jessie Smith, and L.A. VanGogh. Because of the size of the room, there was almost no separation between audience and performers, which created a uniquely personal concert environment. This extended to the time between and after the shows, when performers would hang around to meet audience members and watch the other performers of the night. Coastal Club is a band with the name and the feel-good vibe of a California surf indie rock band. It is therefore hard to believe that they are actually based in landlocked Cincinnati. Coastal Club graced WPGU 107.1 with an interview on January 20th before rocking their set at Sofar Sounds Champaign later that evening. This is one of those bands that is made for this kind of intimate house-show setting. 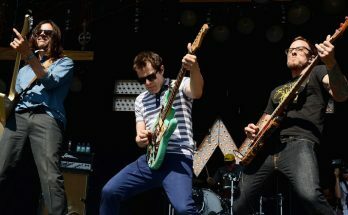 This is not to say that they are not professional – their sound is as clean as any band that can be found on the top alternative charts. But it is clear that they write music to play it for others, rather than just for the heck of making music. During the interview, the band talked about how they prefer house settings like Sofar because the performance becomes a conversation with the listeners. This definitely came across at the show – not just for Coastal Club but for all the artists. Check out our interview with Coastal Club here. 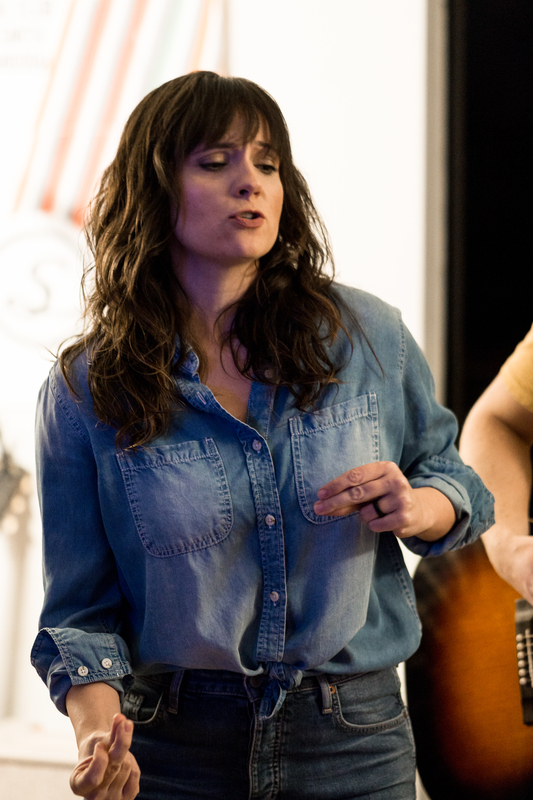 I wouldn’t typically consider myself a fan of Jessie Smith’s self-described “swampy, soulful sound”, but I couldn’t help but smile while experiencing her intimate Sofar Sounds performance. A combination of southern charm and wonderful chemistry with her husband and backing musician made her set an unexpected highlight for me. While her husband plucked along at an acoustic guitar, Jessie sang about income inequality, being in the storm, and waking up in the morning with enough passion and contagious energy to fill the room. I specifically enjoyed how comfortable and confident Jessie was while speaking to her audience. She seemed to be enjoying herself so much, that I felt a natural inclination to enjoy myself as well. 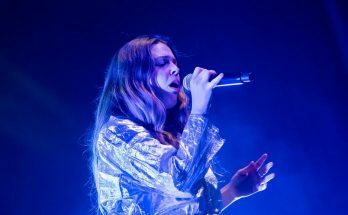 Even in between songs, Jessie’s banter with her husband and with the audience added to the experience and proved that her music is undeniably her, and made it one of the more memorable moments of the night. 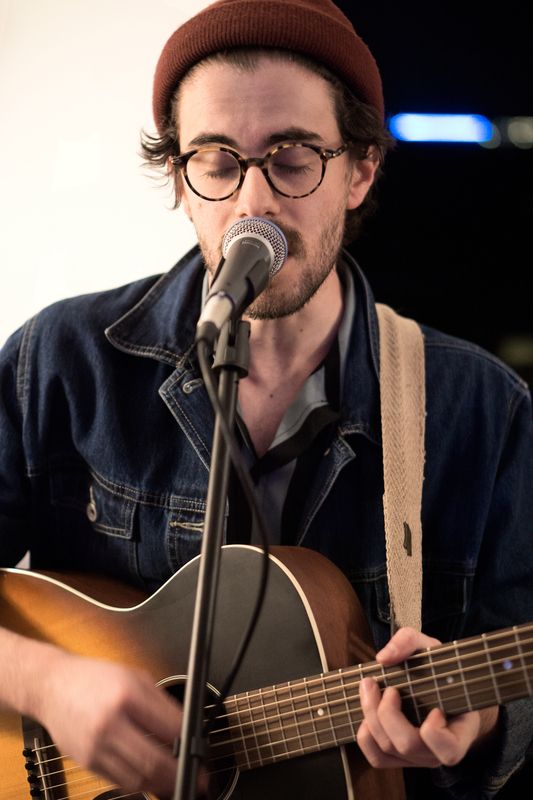 L.A. VanGogh definitely switched up the vibe at the Sofar Sounds event after Jessie Smith. 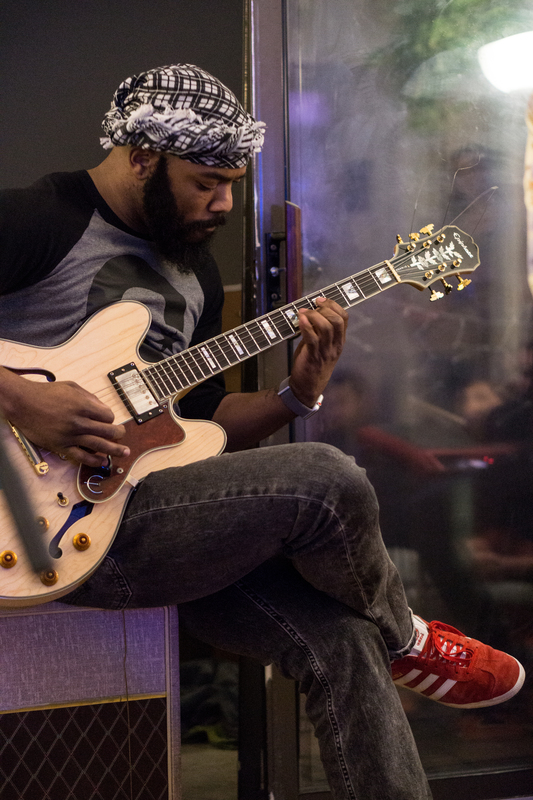 Backed by soothing vocals, guitar, and drums, his smooth jazz sounds mixed with an easily, recognizable hip-hop influence blessed the crowd. After seeing VanGogh in Chicago once, I knew he would be perfect to perform in an intimate setting like the one Sofar Sounds offers. There were multiple times he engaged with the audience whether that be with his music, crowd participation, or his charming sense of humor. By performing on a college campus, he was able to relate to a lot of the people in the room with his own experience of schooling when he attended UIC in Chicago. Not only did he connect with the crowd in regards to school, but he performed a song I am sure many people in the room, including myself, would resonate with. VanGogh got vulnerable and expressed his battle with anxiety. He expressed the idea that thought and the use of words has significant power, therefore we must be mindful of what we tell ourselves and others. 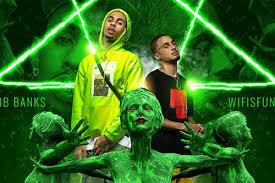 In the song, he equates using his words to using a glock and if we hit the right trigger it could feel like getting shot, urging people to, “Be Careful.” It’s more proof that the artist has a goal to impact others. My favorite part about this particular song was how mello it started off, making you really think about the content within. Towards the end of the song however, he picks up the flow and it becomes more uplifting. To me, that gave me the idea that we could still have fun with it as long as we are careful. Overall, L.A. VanGogh knows how to work a crowd, and there’s something really special about his intimate performance that topped the ending of Sofar Sounds. Check out our interview with L.A. VanGogh here. Mark your calendars, their next show is February 23rd. Make sure to check out past Sofar Champaign performances and follow them on Facebook for ticket information and updates. Nikhil Mehta was born and raised in Fremont, California, a suburb of the Bay Area, but discovered his love of music from the internet. Inspired by the pure expression, creativity, and perspective of acts like Odd Future, Childish Gambino, Danny Brown, and Flying Lotus, Nikhil's passion for finding the coolest new music was born. After making the move to Champaign, he found himself surrounded by a thriving scene of artists and creatives that didn't exist in Fremont, and eagerly took his place within as a host of "Can I Kick It". Besides his music obsession, Nikhil enjoys longboarding around campus, rewatching Netflix shows, and climbing trees.